Entertaining during the holidays is one of my favorite things. I love the opportunity to be fancy, I'll take it any time of the year, but it's especially fun when it's cold out and everyone is ready to celebrate and eat as much as they can. As a child my mother would let me set our dinner table for special occasions. 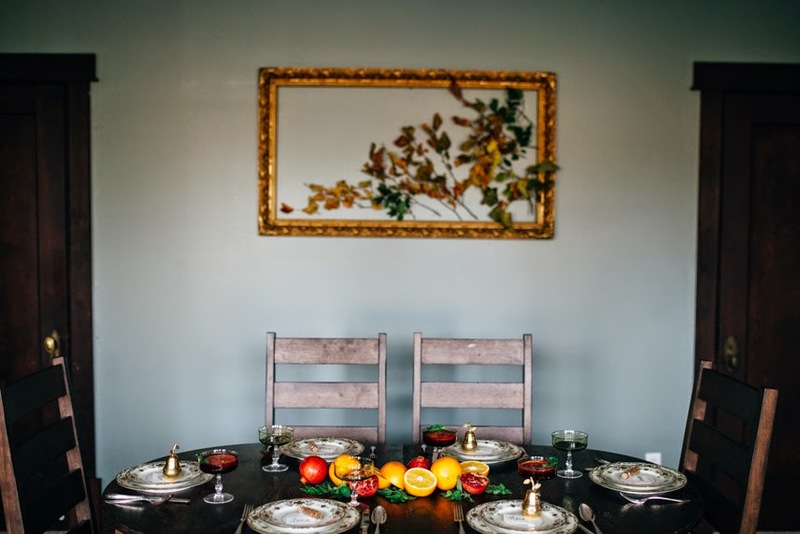 I would admire all the silverware and pretty china, relish the scent of the cabinet the pretty things were stored in, get in a trance ironing linens and flipping through the Emily Post book and memorize how to arrange a place setting. When it comes to planning for a party, nothing beats an intimate gathering. One that is just small enough to focus entirely on the intricate details. Six place settings at a cozy table says it all to me. Think of of the deep conversations that will ensue. I'm loving fresh centerpieces right now. Think fall foliage, squash and pumpkins from your garden, fruits, bright roots or branches. I was inspired by jewel tones and winter fruits and added some mint for contrast. There are some tips to keep in mind when arranging a centerpiece. In my opinion your goal should be to create a beautiful arrangement with as little clutter as possible. 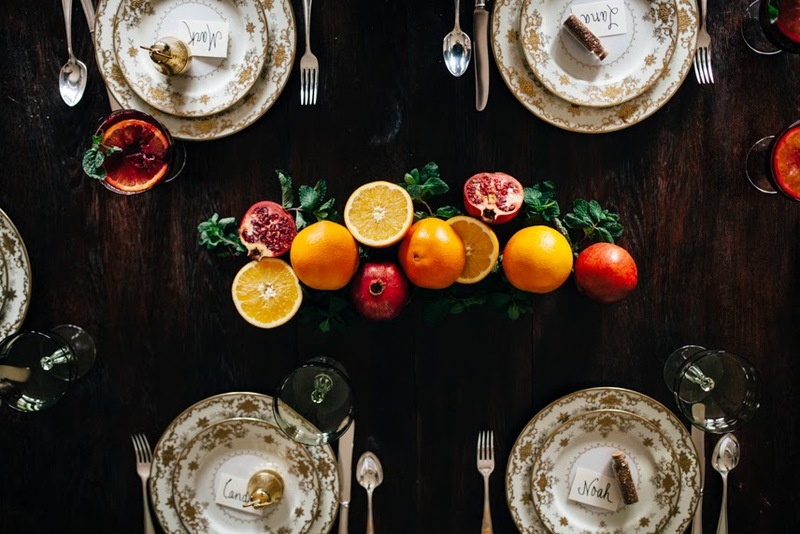 While table settings that are jungles of beautiful, shiny things can be inspiring, the lack of space is not. You wind up moving the little details all over the place and sometimes entirely off the table to make room. I don't see the point. 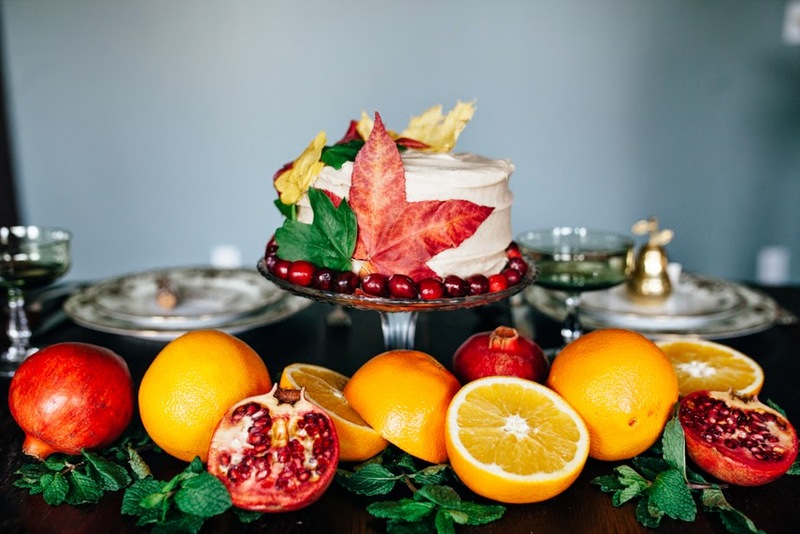 Try to avoid items that are overwhelmingly distracting or too tall for eye to eye contact from across the table, but add height with a cake or candles. When it comes to candles I prefer them short and stout, with enough height to add dimension. Place cards are always a must. You can create a lively and fun environment just by placing the right people next to one another. Separate couples to some extent, sit the quiet next to the talkative, people with similar interests in close proximity and keep friends that tend to create a cliquish vibe apart. 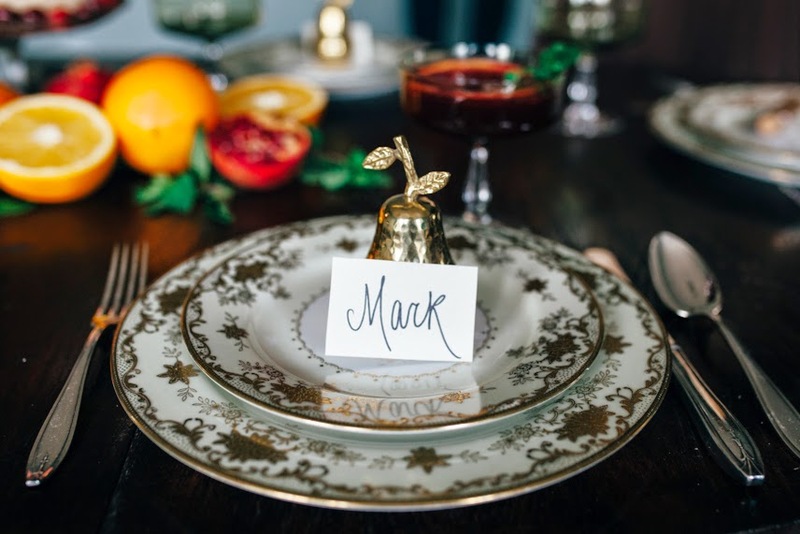 Whether you decide to go all out creatively or simply place a printed notecard on a plate, do go for arranged seating. For my place cards, I chose to add the last touches to our table with some lovely pieces from a local boutique in the North End. Evolve Home has so many gorgeous tid-bits to choose from, I highly recommend stopping there to stock up on Holiday details for your home. Here's to a beautiful table! I hope you all have a wonderful Thanksgiving. **To check out more parties I have style, click the "parties" tab above. Here's a favorite of mine. If you are interested in hiring me to style your affair email me! BEAUTIFUL tablescaping. It is perfection. Wow! I love your taste. Love the plates and even the decor. Thank you for sharing. I love your tablesetting! I am planning to do the same too since I just got a new set of flatware. Thank you for your very inspiring post! It's so lovely! LOVE it! I love the trinkets on the place settings too. Im not hosting Thanksgiving this year and it kills me. I want to get out all the napkin rings! That Thanksgiving layout is beautiful! If only my family did something like that! That is absolutely perfection. I love the centrepiece. Holy, wow. So beautiful - I want to come to this Thanksgiving just to admire everything in person! Spectacular job. The centerpiece is GORGEOUS! So simple and beautiful. The color are lovely. So pretty! The intricacy of the plates perfectly balances the simplicity of the fruit. 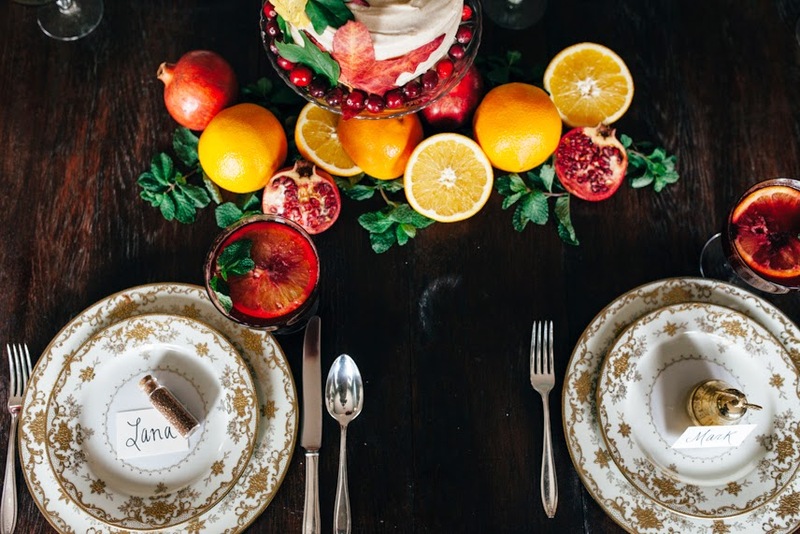 What a gorgeous way to start your Thanksgiving feast! Ohh, I love this! The centerpiece is perfect, and the details all come together so nice! A good tablescape really sets the mood. Happy Thanksgiving! That is an absolutely gorgeous table setting. Have a Happy Thanksgiving! Wow, your table setting is stunning! I love it! Oh my gosh this is gorgeous. I want to be a 'centerpiece' type of person - maybe when the kids are a bit older. 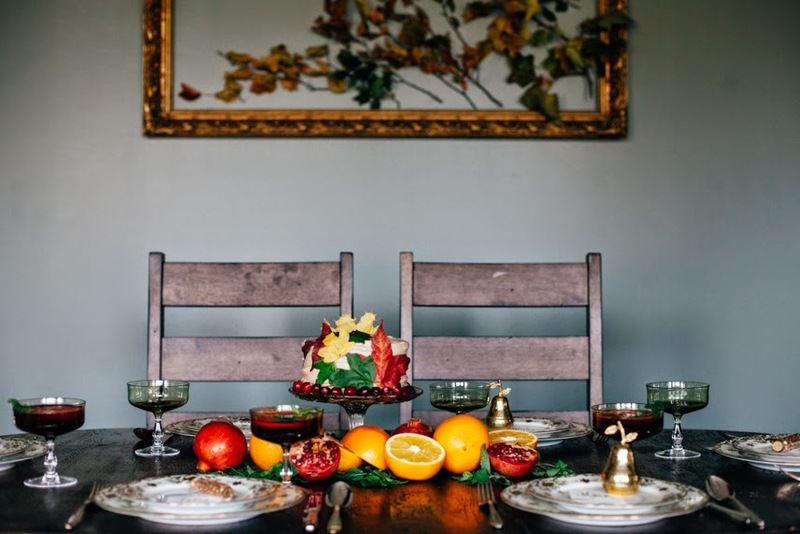 A beautiful and welcoming holiday table. A lovely table always makes an occasion more festive. Wow, this is so pretty! Loving the color palette you selected for the arrangements! What a beautiful and elegant table. Excellent photography! 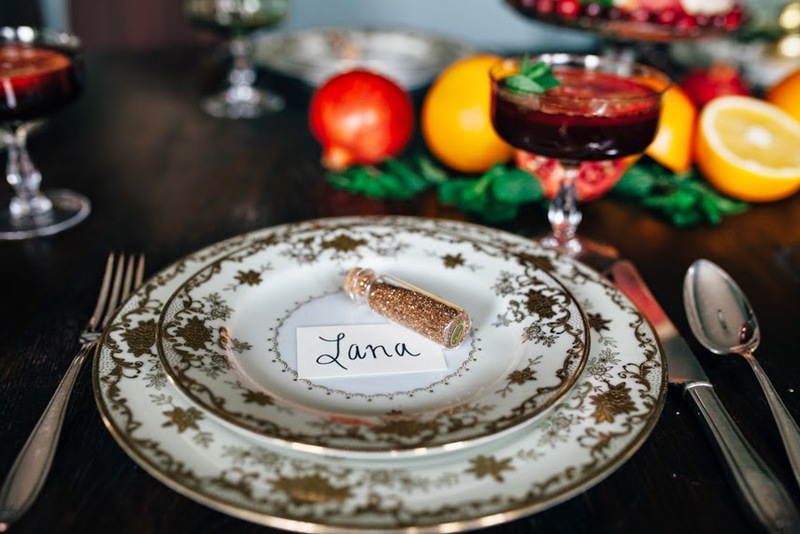 I love the place settings, the citrus and the pomegranates really stand out. Additionally, you have great advice! Wow. Everything is beautiful. I love the coloring and the photography. Thank you for some ideas for next year! Wow! What a gorgeous set-up. It's simply beautiful. So beautiful! I love hosting the holidays. Table escaping is so fun. Gorgeous! I love the entire layout. So festive. Yea my Thanksgiving table didn't look this pretty. Beautiful settings! I just love it! Wow, what a stunning table setting! You are so talented!